As you may have surmised from some of my recent blog posts, last weekend, we went camping with a group of people to the Great Sand Dunes National Park. 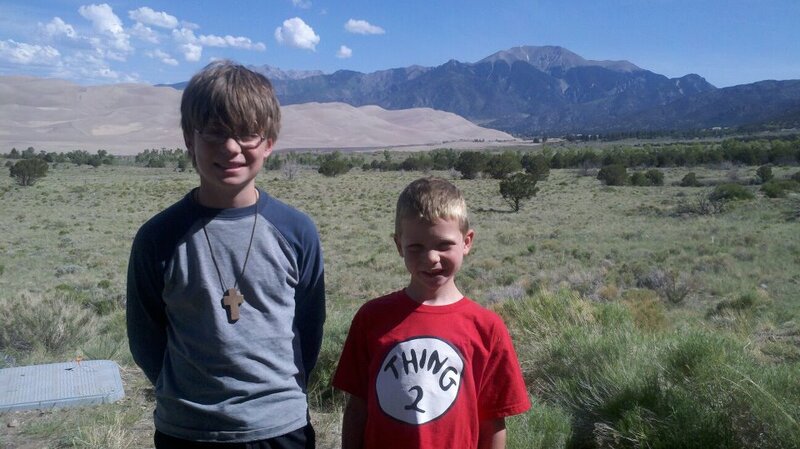 The Great Sand Dunes are always fun. My family spent a weekend in the park's campground last year, and had a blast (see Laser Camping in the Salt, Videos from Laser Camping in the Salt, and Guitar Lady Goofy Kid) . I especially suggest going back and looking at Videos from Laser Camping in the Salt as it features some pretty cool videos of sledding down sand dunes. One cool thing about the dunes is a shallow, wide creek at the base of the dunes. It dries up in the summer, and so last year we didn't get to see it (or play in it). This year since it was earlier in the year, the creek was still around, making the whole experience even more fun. I think this hammock should be used for relaxing. The boys seem to think that is is also a toy. Connor and his buddy pretended it was a pirate ship. Classic view of the mountains behind sand. He did not do as much sledding this year. Tyler did do a bit, though. One of the things we did was go up on the sand dunes at night. The kids played capture the flag while the adults sat around talking and things. It got too dark for pictures, but I did get a couple before things got too bad. Starting up the dunes at night. On Sunday, we went back to "the beach". The bigger kids built a dam and the littler kids built an island. Most of the adults left the kids with me for a couple of hours. Not sure I was the best choice to keep their children safe, but whatever. I did have fun helping with the dam. I was the biggest kid there, afterall. Eventually, we had to have lunch and while we were eating, the water broke through the dam in a couple of places. At that point we decided to give up on it. It was a really impressive piece of construction while it lasted. On Monday, we packed up (my family won the packing-up race that day) and stopped by the visitor's center. We drove home.